Boss Gavin Cowan has challenged teenage loan star Ryan Sears to build on his promising start at AFC Telford United. The 19-year-old defender is with the Bucks for an initial month from Shrewsbury Town. He shone in the 0-0 draw at Kidderminster Harriers on Tuesday night, making a last-minute goal-line block. "He may have put a couple of feet wrong, but he can be forgiven when you take into consideration he's only 19 and has just come into a new group," said Cowan on Sears, who impressed greatly on loan at Welsh Premier side Newtown last season. "He's only been with us for a week and the lad has adapted really well. "He's a great character, exactly the type that I wanted around. I don't bring people in for the sake of it. "I've done a lot of intel around him and I've got a good relationship with his agent. "I've really enjoyed bringing him in and I'm pleased he did well at Kidderminster." Sears was brought in to ensure Telford had enough at the back to cope, with former Salop centre-half Dom Smith suspended for the first three games of the campaign. 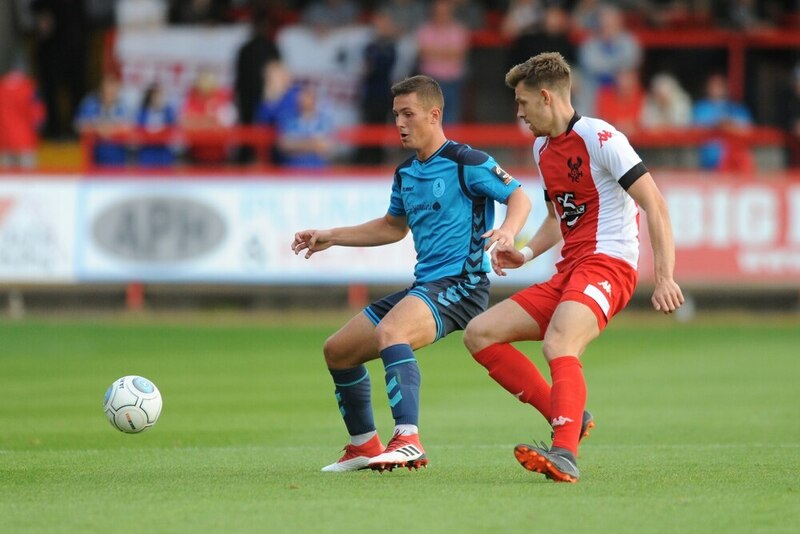 He played at right-back at Aggborough, and after coming on in Saturday's 1-0 win against Southport, but can play at the heart of defence as well. On what is his best position, Cowan, who was a centre-half, added: "It's going to be push for him to play at centre-half. "In terms of his attributes, he's a full back but if we want to go to three at the back he can perhaps play there. "He's done great. He's just got to maintain that now – and that's the message to all of the players. "It's great, a good start, but how long can we maintain that for? "That's going to be the question that's asked for every game." It is thought Town would be open to Sears extending his stay at the New Bucks Head, as long as he continues to play regularly. He was a mainstay in the Newtown side and ended up winning their players' player of the year award. He is contracted at Montgomery Waters Meadow until next summer.